I had never known or heard of powerlifting before in my life and after an unsuccessful run in bodybuilding I crossed paths with an individual who identified himself as a former powerlifter. He then helped me achieve things during my squat workout, that day, which I never thought I could have done ever in my life. At that moment, I realized I had a treasure trove of potential and decided that aesthetic goals were not for me. I did some research on this new phenomenon called powerlifting and decided to give it a try. I have been a Raw lifter up to this point. I have never been in gear but am currently looking to change that. I expect to be in single ply by the end of 2017. There are so many enjoyable aspects about this sport that I love. However, to keep it short, I really enjoy the camaraderie. No matter where you are or where you’re from, powerlifters are all out for the same goal; to be better than their former self. 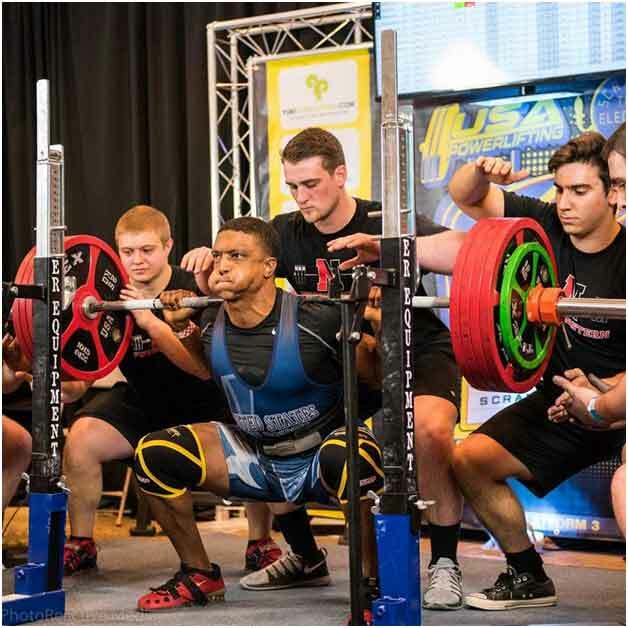 Rather than focus on what the other guy is doing (or not doing), powerlifters mostly concern themselves with achieving their personal goals. Since I am a student of the sport, all those who have been here before me and achieved great things are all influences for me. Much of my success early on came from a good friend Marcus Mucheck who learned from Louie Simmons. However, I have been privileged enough to receive direct mentorship from the minds of Steve Goggins and Gene Bell over the last 16 months and my knowledge bank has grown exponentially – I couldn’t be more grateful. Focus and discipline rank high as a priority in my training. Next would be my warmups, cooldown, recovery and conditioning. I place great emphasis on these aspects of my training because without them, I would not be able to sustain an optimum performance level not to mention longevity in the sport. Proper warmups and cooldowns are invaluable in anyone’s programming because they prepare the body for work and provide the body with proper de-escalation immediately following work. Conditioning is important for my military service as well as allowing me sufficient endurance to last during those long meet days. Recovery is self-explanatory; you must allow the body to recover from the dress placed on it or you won’t last long. My children are my biggest motivators. They set a high standard of performance for me to live by and I hate to let them down. This is closely, followed by my own hatred for being average. Self-doubt, loathing, and all those other haunting things that begin to creep in when you become unfocused on what’s really important. Feeling like I should give up and pursue something different because things aren’t going quite as planned. Powerlifting has allowed me to become more humbled. The sport has helped me recognize that no level of performance or accomplishments should be what defines who you are. A multitude of medals do not make you better just as a lack thereof does mean you’re worse than someone else. There’s always someone stronger than you, just as there’s always someone not as strong as you. Be humble and understand there are always areas to improve. Always be receptive to good honest feedback. Do not compare yourself to other lifters. Do not pay attention to what they do. These are only distractions. Stay honed in on your goals and let nothing stop you from reaching them. Your numbers do not have to be as good as or better than the next guy (or girl); they only need to be good for you. Be humble. I had only read about Steve via EliteFTS articles and in various publications (Power magazine). Then I had an opportunity to actually meet/talk to Steve at 2015 USAPL Raw Nationals and after having seen the success of some of his athletes, bringing truth to what I had previous read. I decided to contact him regarding coaching. Being part of a team (I never had that); a network of lifters who share the same goals. Also, the prestige of mentioning that I am part of such a legendary society of people. I feel better aligned to reach my goals. I’m more confident in my training and my own abilities. Things move good in the gym and my wealth of knowledge has increased so I am better equipped to mentor others and help our sport grow and foster.